Why to enroll in this course? Live Demo: This is the only course which provides a live demo of the portal where the trainer practically shows how to file GSTR-9 on the GSTN portal. You will get a practical hands on experience and will be able to file GSTR-9 with ease for any type of client. Language: Hindi – for the benefit of majority of members. Duration: The video is of 6 hours(approx.) which itself is the proof as to how comprehensive the recording is. While other videos or seminars are completed in maximum of 1-2 hours. Notes: The trainer has referred almost all the books available in the market including ICAI’s Technical Guide on GST Annual Return. Self prepared notes of the author along with the portal screen shots ad FAQs have been provided for through understanding and easy reference. Coverage: Detailed analysis of each table of GSTR-9. Flowcharts, examples, diagrams, summary etc are used to make the subject very simple for everyone. Real life practical issues are used as examples to explain the concept of GST annual return. Inclusions: GST Annual Return GSTR – 9 videos, E-book. Who can enroll in this course? – Anyone whether in practice or not who wants to become an expert in filing of Annual Return GSTR 9. So are you ready to become an expert in filing GSTR 9? If yes, then enroll for this course. Form GSTR-9 (See rule 80) is covered in depth. Note:GSTR 9A, 9B are not covered as it is not relevant for everyone at large. After watching this video you will become an expert in filing GSTR 9. Table wise analysis is done in depth and in a very simple manner to enable you to file GSTR -9 of any client. Live Demo: The main attraction of this course is the live demo where the trainer has explained the provisions using the live demo of the GSTN portal. Expert in GSTR-9: After availing this course, you will become expert in GSTR-9 and will be able to file GSTR-9 of any client with ease. In depth analysis: This is the only course where GSTR-9 has been explained in depth for approx. 6 hours. Whereas all the seminars across India for GSTR-9 are maximum for 3 hours. This shows the depth of knowledge you will gain after enrolling to this course. GST Annual Return made simple: GST Annual return which is a comprehensive format is made very simple. Staff Training: You can enroll in this course and use it for staff training as well. Simple notes: In comparison to books of hundred or thousand pages on GST, the author has explained in a lucid language to cover the topic comprehensively. E-Book: Customized E-book is provided along with the course for easy reference. E-book contains – Notes of GSTR-9, Screenshots of the portal for GSTR-9 to understand how to prepare and file GSTR-9 with hands on practical experience, FAQs of GSTR-9. Practical Examples: As the trainer has vast practical hands on experience in GST, he has used practical case studies to explain different provisions of GST. Whether you are a Chartered Accountant or any professional or a businessman and want to understand the concept of GST Annual Return in an easy way then you must enroll in this course. In depth knowledge: You will get in depth understanding of the FORM GSTR-9. Time Saving: It saves a lot of your time in reading lengthy books and understanding the subject in the right manner. Job opportunities: After enrolling in this course you will have better job opportunities in the field of Indirect taxes. Better understanding: GST is a vast subject and all the provisions might not be applicable to your client. So the notes of the trainer would help you to understand and use the relevant parts of the provisions applicable to your clients. Professional growth: As the quality of providing the service increases you will be able to grow professionally and serve your client better. This video can be one of the mediums for it. 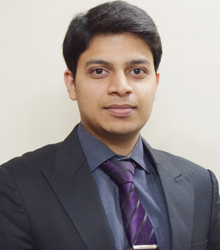 Vivek Agarwal is an Associate member of The Institute of Chartered Accountants of India. He is also a Company Secretary and Bachelor of Laws. He is an expert in GST handling all the matters related to indirect taxation. He has good experience in handling Survey, Search & Seizure cases and Income-tax Appeals related work. He co-authored the said book titled "Tax Payers' Practical Guide to Survey under Income Tax Act, 1961". He also made presentations in the seminars of ICAI. He is specialized in providing tax consultation and advisory solutions in the matters of Goods and Services Tax (GST).